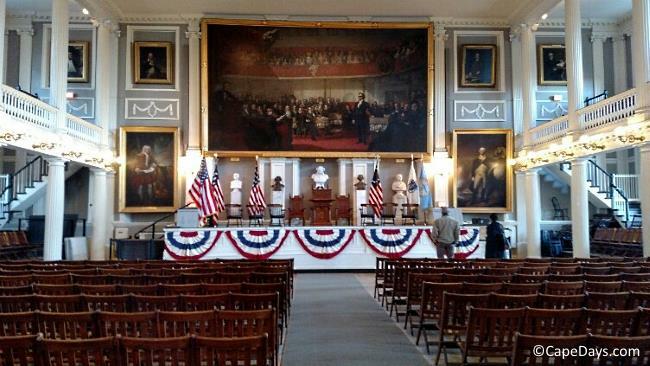 Question: My wife and I will be relocating to Massachusetts from Pennsylvania. I have spent most of my life going to the beach at Ocean City, Maryland. I'm not sure if you're familiar with that area but it is similar to the beaches in Delaware and New Jersey. We are looking at the Bourne area. I was wondering if the beaches around Buzzards Bay were anything like the east coast beaches I'm familiar with. From what I can gather, the waves are much smaller; but I'm more interested in the sand. Are the beaches there soft and sandy, or are they more packed and have more rocks? Please pardon my delayed response to your question. A small family emergency has kept me occupied and off-line for the last few days. But all's well, and I'm back at it now. Yes, I'm quite familiar with the NJ, DE, and MD beaches. When I was a little kid growing up in northeastern PA, my family used to vacation at the Jersey Shore. During my college days in Delaware, I became a huge fan of the DE and MD shoreline. (I vaguely recall ditching a few classes in favor of a trip to the beach ;-). Anyway, to answer your question ... the beaches on Buzzards Bay are entirely different than what you're accustomed to in Ocean City. On Buzzards Bay, the shoreline isn't long and straight, as it is on the Atlantic Ocean in OC. Buzzards Bay has more of a "nooks and crannies" shoreline, with inlets, harbors, salt creeks, and anchorages scattered here and there. On Buzzards Bay, the sand is, overall, more granular and, in places, more pebble-y, than what you're used to. One exception is Old Silver Beach in North Falmouth. Old Silver is one of the most popular beaches on the Upper Cape, thanks to its light and fluffy sand, warm water, and beautiful views. All that being said, please remember that when you live on Cape Cod, you're surrounded by salt water. 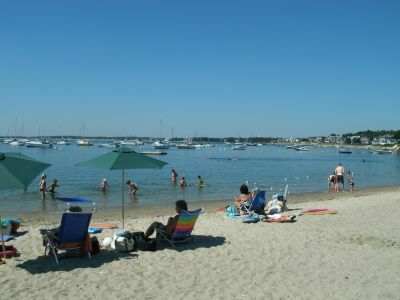 Buzzards Bay beaches are just a tiny fraction of the many options you'll have for your beach excursions. 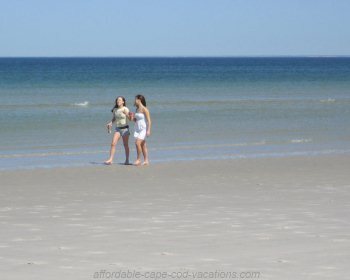 For wide open spaces with soft sand, great surf, and phenomenal scenery, you can head out to our Atlantic Ocean coast. It'll take you about an hour to get there from Bourne, or somewhat longer if you're venturing out there on a busy summer day. I think it's abundantly fair to say that our Ocean beaches are among the best in the entire US. Coast Guard Beach in Eastham regularly makes Dr. Beach's "Top 10" list, often beating out some of the most renowned beaches in the Carolinas, Florida, California, and Hawaii! 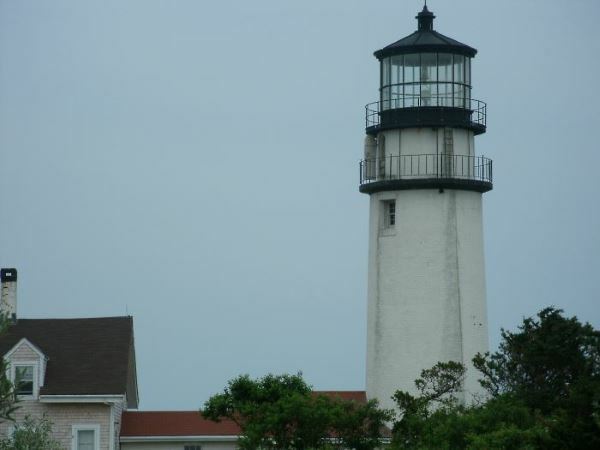 For an entirely different experience altogether, you'll also be within easy reach of a number of beautiful Cape Cod Bay beaches. 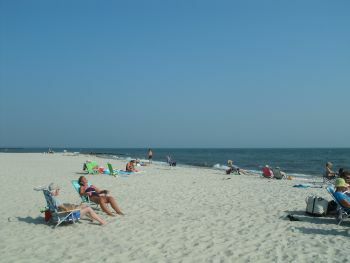 In Bourne and Sandwich, the Bay-side beaches tend to be pretty pebbly from the high tide line out to the low tide line and a little beyond, and the sand is generally more granular than on the ocean side. However, as you go farther down-Cape, to the towns of Dennis and Brewster (about 30-40 minutes from Bourne), the sand on the Bay becomes noticeably fluffier, less pebbly, and the beach area grows exponentially - especially on the outgoing tide. At low tide, you can literally walk for miles on the sandflats. And sunsets are spectacular. Then, there are our Vineyard Sound and Nantucket Sound beaches. This is our southern coastline, running from Falmouth and Mashpee all the way out to Chatham. On the Sounds, there's a nice mix of large, mid-size and small beaches. The sand quality on the Sounds varies from moderate to soft, as does the pebble, shell and seaweed factor. 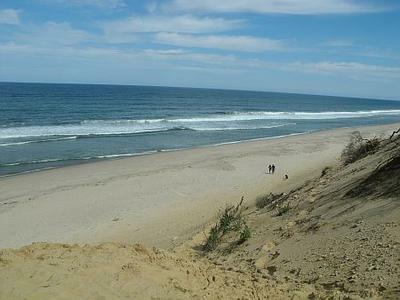 From Bourne, you'll only be about a half hour from one of my favorite Sound-side beaches -- South Cape Beach in Mashpee. With its wide-open vistas, backed by acres of nature preserve and walking trails, it's a definite "don't miss", IMHO. 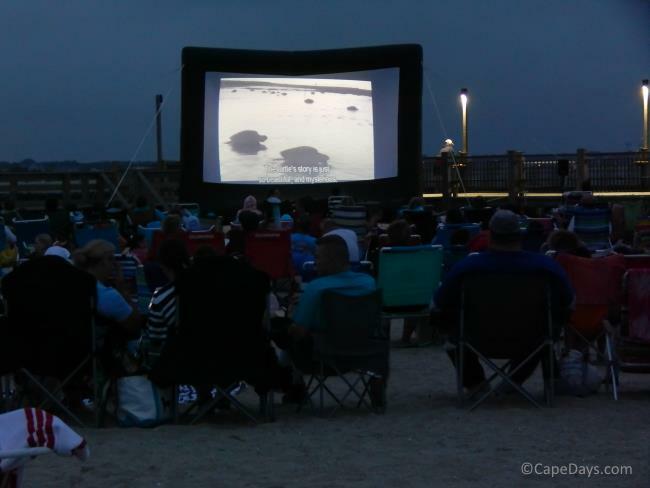 There's one other thing I'll mention, just in case you're not aware of it already: The "beachy vibe" here on the Cape is also quite different from what you're accustomed to. When you think of the Jersey Shore and Ocean City, what comes to mind? A seaside strip lined with hotels, motels, bars, restaurants, shops, and an almost mind-boggling array of arcades and other funky entertainment - all just a short stroll from the water's edge? Well, on Cape Cod, our beachfront has a much more laid back, almost rural feel. In the National Seashore area, the land is federally protected, so there's virtually no commercialism on the immediate coastline. In other parts of the Cape, there are towns (areas of towns, actually) that have a good number of beachfront lodgings, dining spots and waterfront activities. But even there, it's a whole lot more "small town America" feeling than the hustle-bustle seaside resort city atmosphere of Atlantic City and Ocean City. This sometimes comes as a surprise to many first-time visitors ... but generally, a very pleasant surprise. I hope this info helps. You'll find tons more in my All-in-One Beach Guide. Check it out!